Theres a serious chill in the air in NYC. I know, it's December of course it's cold, but man I was not ready for it! There's pretty much nothing better than a hot pot of soup cooking on a chilly night. I love making soup for a few reasons. 1- The warmth and scent it gives the apartment. 2- The versatility of it. 3- The yield- dinner for days! This soup is super easy, incredibly delicious and quick! Using beans in both the base and as a stir in gives this soup some weight and protein which enables it to be a great, filling meal. 1 / Heat the oil in a large pot over low-medium heat. While the oil is heating, dice zucchini and onion. 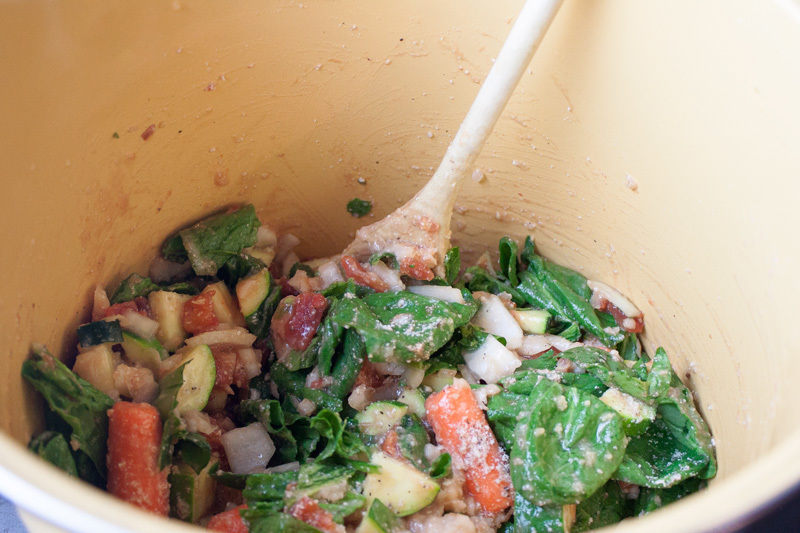 2 / When the oil is warm, add the zucchini, onion, spinach, garlic, salt, pepper, thyme, and parmesan cheese. Stir with the warm oil, turn the heat up to medium and let cook for 5 minutes, stirring occasionally. 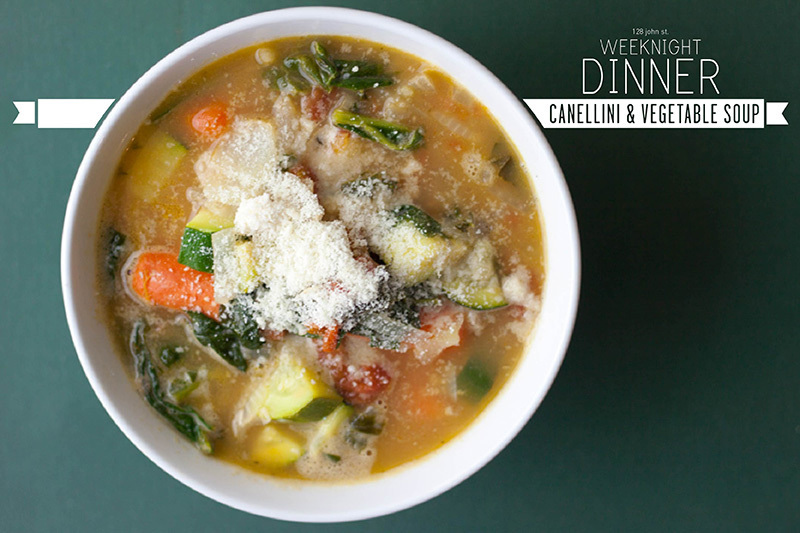 3 / While the vegetables are cooking, using a masher or back or a large spoon, mash 1 can of canellini beans until almost smooth. 4 / After the mixture cooks for 5 minutes, stir in the tomatoes, both the mashed beans and the second can and the container of vegetable stock. Raise the heat to high, cover and bring to a boil. Cook for an additional 20 minutes, stirring often. Alright, you caught me, I used carrots and didn't tell you to. Here's the deal- when I was cooking this baby up, I thought to myself "Veggie soup IS NOT soup without some carrots", so I used a cup of baby carrots, but I think that they don't belong with the smooooooth flavors of parm and bean. Your call though bud. If you want to use carrots, throw them in the pot when you toss in the other veggies. They may take a bit longer to break down than the other veggies, so you'll have to cook it longer OR cook them a bit before you toss them in the pot with their friends zucchini and spinach. This soup is my A#1FAVE soup I've ever mixed up, and I think the mashed canellini bean base is the reason. White beans add a creamy, sweet flavor to the broth. It's pretty ace. My roomie, who is not a veggie fanatic like me and DOES NOT like beans thought it was pretty ace also, so ya know, I'm awesome like that, converting the haters and all. Sprinkle some more parm on to and call it dinner (everyone likes a bit more cheese, right?). Like I said earlier, one of my favorite parts of making a big pot of soup is the amount it makes! Let the soup come to room temperature and pour into plastic containers (I can't be the only one who saves all my take-out soup containers... right?) and stick in the freezer! Soup can freeze for 2-3 months! When you're ready to dive back in, defrost in the refrigerator and then heat in either the microwave or in a saucepan on the stove. Easy-peasy around here. What kinds of soup do you like to make when the air gets crispy?